Since I’m planning to go to the Copenhagen Climate Change Conference in December, it seems only appropriate that I should show up to local efforts to address the topic. 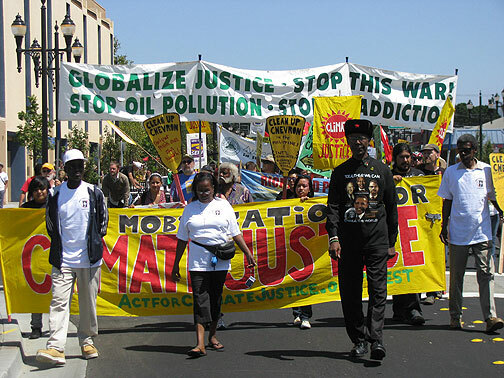 After an intense flurry of dozens of messages sent via Facebook (and Twitter, were I using it, which I won’t) I thought the “Mobilization for Climate Justice” yesterday in Richmond would attract a couple of thousand people or so… But no, there weren’t even 300 people at the rally near the end of the BART line in Richmond. It wasn’t entirely the same old people, but it was one of those political experiences that reward the patient and frustrate anyone who thinks something as difficult as this is easy. 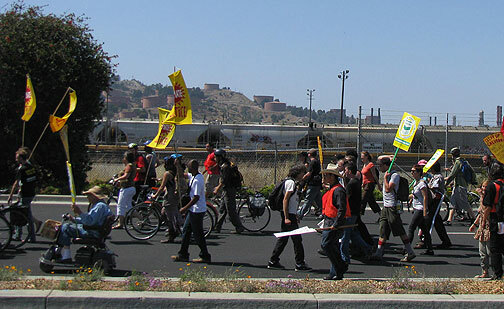 The march starts, led by Henry Clark of the West County Toxics Coalition (in the black hat). 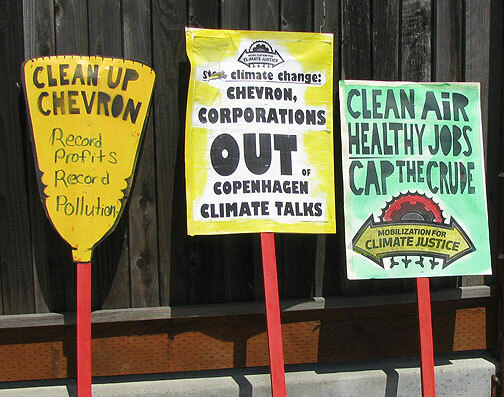 I have friends who have doggedly organized against Chevron for years now, trying their best to connect to the local efforts against toxic emissions and pollution and for environmental justice, so I was surprised at how few locals attended the rally. I joked with Robert as we got back to SF that at least we felt better for having gone, and had to acknowledge that it wasn’t much different than the people who feel better for having gone to church. Leftist demonstrations seem to have fully collapsed as meaningful political forms now, and only the true believers can maintain any sense of efficacy in participation in them. 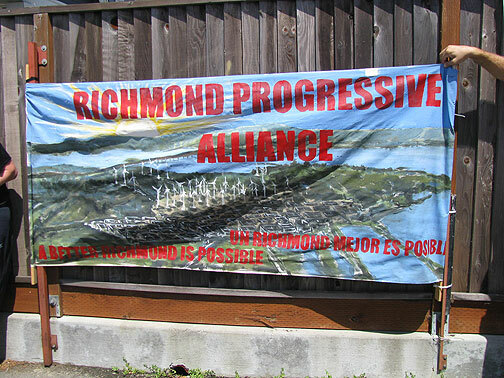 Richmond elected a Green mayor last time around, and there's definitely a growing vision of a new life growing here. Some years ago Chevron and the other local oil companies painted their many storage tanks a dun brown to make them blend in with the landscape better. I wondered if they'd consulted with the brilliant painters of Victorians in San Francisco? We marched through Richmond, passing a busy church of Pentacostals who watched us pass without hostility but without much curiosity either. The gulf between our lefty march and the daily lives of the mostly black community seemed pretty cavernous. It’s August and in the U.S. there’s always a weird “news gap” that gets filled with one hysterical campaign or another. This year we have the frightened white patriots who have latched on to the (practically useless) health care reform plan as their current bete noire. The bizarre shift in the public “debate” on health care has been astonishing to watch. Somehow, a bad pro-corporate, pro-insurance industry “reform” that will basically force everyone to buy private insurance (with” hopefully” at least a guarantee that they’ll actually cover you when you’re injured or ill) to be “responsible” citizens has been framed as a Socialist or even Fascist takeover of America!Â (Currently insurance companies employ thousands of clerks whose basic function is to deny coverage on small print technical grounds to as many paid up insured as possible. It’s a huge criminal racket, to put it mildly, and they’ve enjoyed double digit profit increases for the past half dozen years, raking it in before the inevitable “reform.” But under Obama, the reform will hardly touch their profitability or power… Hope Fulfilled!) The 60%+ of the population who prefer a national health care system like in Canada or the UK (“single-payer” is the dumb name they’ve embraced… like “single-payer” military procurements I guess!) have been systematically eliminated from public debate on television and in the papers. Thanks to self-organizing and huge efforts by nurses unions, lefty doctors, pwogwessive NGOs and others, the politicians have had to repeatedly declare that they “do not favor a single-payer system.” So it’s out there, even if it’s denied before the debate began. Then you have the amazing ideologically driven hypocrisy of buffoons like Glen Beck on Fox, who Jon Stewart did a nice job of skewering the other night. Apparently, Beck had a bad medical experience a couple of years ago and spent many hours on air decrying the failure of the U.S. medical system. Now, he’s singing in the chorus with all the right-wing blowhards who see this as Obama’s Waterloo, crowing about the U.S. medical system as the best in the world! A sad joke to say the least. So we need a political climate change here in the U.S. The corporate media is so skewed to the right that corrupt corporations are always framed as on the side of individual freedom and the government’s efforts to improve public services are framed as restricting individual well-being. It’s an upside down world here and hard to grasp if you’re not living in the middle of this Alice in Wonderland madhouse. 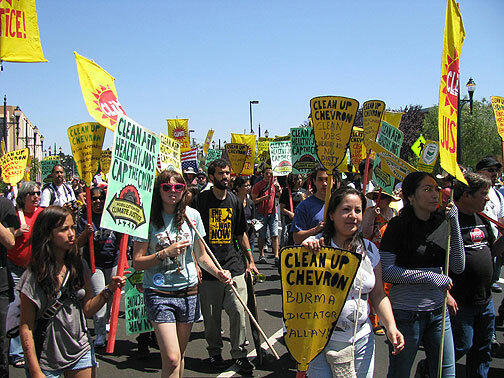 Nothing new, really, but you see the effects of it in the paltry turnout for a well organized demonstration against the multinational Chevron on multiple important grounds: to slow climate change, in favor of environmental justice in Richmond, in Burma, in Nigeria, anti-war in Iraq, etc. Multinationals have no trouble engaging on multiple fronts and multiple issues, and if we’re to oppose them meaningfully we need to ally across multiple issues and frameworks too. I thought the Richmond demo yesterday was a good try, and it depressed me that so few people turned out. It’s the form of demonstrating that’s dead, and no amount of twittering or social networking seems to dent that truth. Reinventing how we organize involves a change of climate, a change of behavior, and a change of luck! On a separate note, I’ve enjoyed my daughter visiting this past week, and we took a trip to Santa Cruz the other day. It was a spectacularly beautiful August day, crystal clear, and we drove up into the Santa Cruz Mountains to get down there. At a viewpoint on Skyline Blvd we got these great photos of the view north and east, and then we came upon the billowing clouds of the big “Lockheed” forest fire in the mountains. 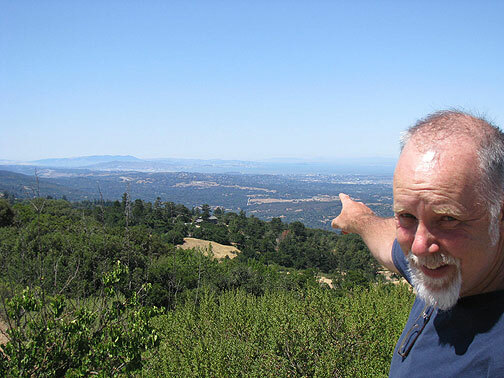 I'm pointing north to San Francisco, hard to see in the distance. 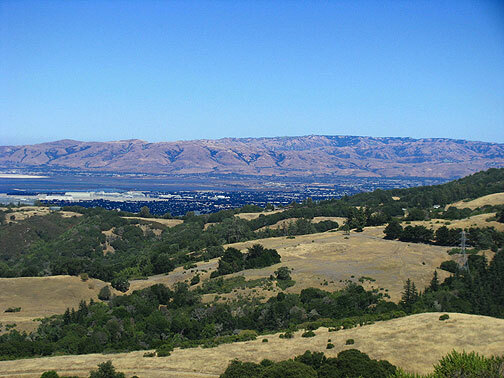 San Bruno Mountain, Mt. Tam and San Francisco from far south. Northeast view across Bay. Good to remember that plans were thwarted to fill most of this with debris from San Bruno Mountain and make hundreds of square miles of more freeways and suburbia, turning the Bay into a brackish river in the middle! Amazingly clear day in the South Bay. 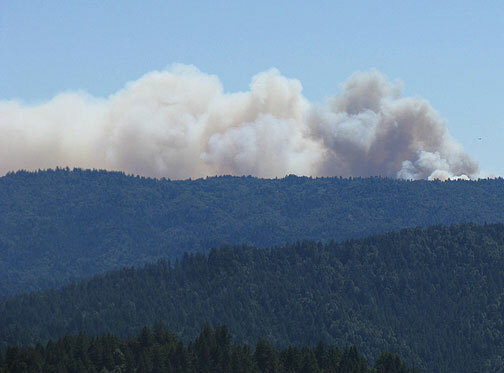 The "Lockheed" forest fire in the Santa Cruz Mountains, Aug. 14, 2009.